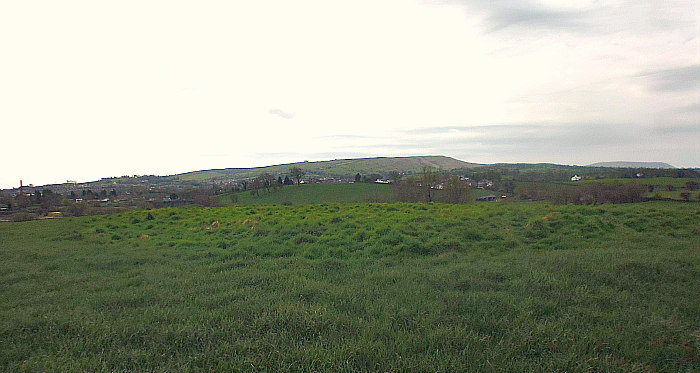 Gilbeber Hill, near Greenberfield, viewed from the south. 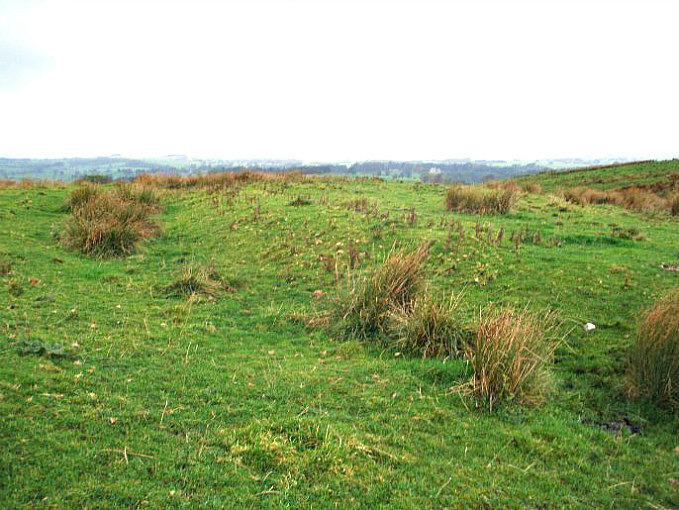 Gilbeber Hill Earthwork near Greenberfield, Lancashire. OS Grid Reference: SD 87627 48284. 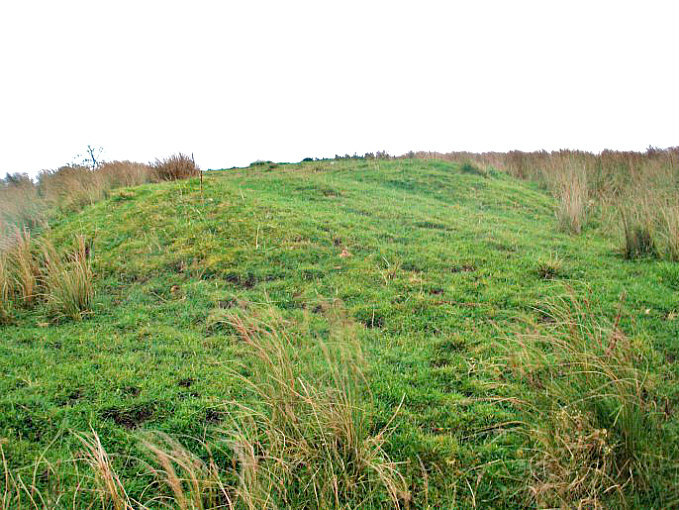 About halfway between Greenberfield and Bracewell, in Lancashire, is Gilbeber Hill (sometimes spelt as Gilleber), and an almost square-shaped earthwork consisting of a raised outer bank and, near the centre, a small raised platform with a little stone. The rough, grassy earth-work has been considered to be a Roman camp, a Medieval enclo-sure, or perhaps a Civil War encampment from the 17th century! Bracewell was originally part of the West Riding of Yorkshire. The Roman road linking Ilkley in the east with Ribchester in the west runs close to Gilbeber Hill, the course of which is still to be found at Brogden Lane to the southwest. From the footpath (at east-side of Sewarage works) on Greenberfield Lane: head across the field to a second wooden gate, then continue on this footpath to the foot-bridge over Stocks Beck. Gilbeber Hill is the low, grassy hill on your left; the footpath runs around the base of the hill towards a third gate and then onto Gisburn Road. 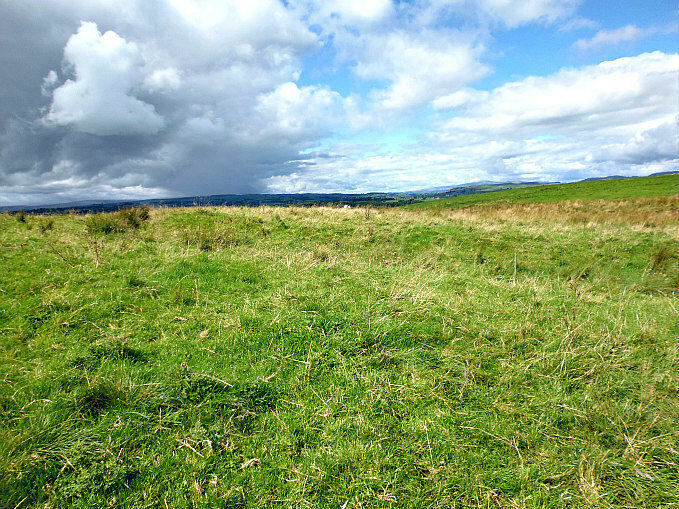 A similar earthwork is to be found on Hawber Hill ½ a mile to the northwest. Gilbeber Hill Earthwork near Greenberfield. The Western side. Gilbeber Hill Earthwork. The small raised feature at the SW side. 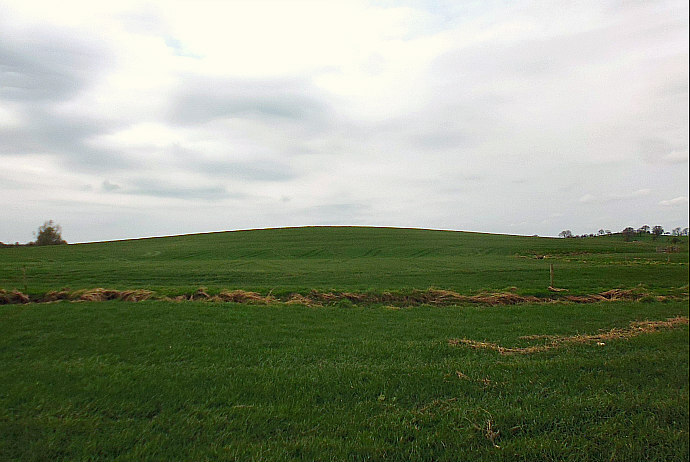 The rectangular-shaped earthwork atop Gilbeber Hill (drumlin) is a raised, grassy area with a visible bank around its edges which measures between 1-2 feet in height, and there are slight traces of an outer ditch. Nearer the centre at the W side is a small, raised square feature (platform) with a little stone standing upon it, but whether this ‘white stone’ was part of the earthwork structure is not known; it may have come from somewhere close by. At the E side is what might be an entrance? The earthwork is roughly 24m x 26m and 632-756 square yards with a parameter length of 101m covering 0.156 acres of the flat hilltop site. But was this a temporary camp from the late Roman period, or perhaps a Romano-British farmstead (similar to Bomber Camp near Coal Pit Lane)? or was it a medieval settlement/enclosure? or could it have been a Civil War encampment from the 1640s? – this we don’t know with any certainty. There don’t appear, however, to have been any Civil War camps in this part of west Craven, and so that theory must be dismissed. The PastScape / Historic England Monument No. is: 45403. Dixon, John & Phillip, Journeys Through Brigantia Volume One: Walks in Craven Airedale and Wharfedale, Aussteiger Publications, Barnoldswick, 1990. Categories: Earthworks, Roman Camp | Tags: Gilbeber Hill Earthwork near Greenberfield in Lancashire | Permalink. 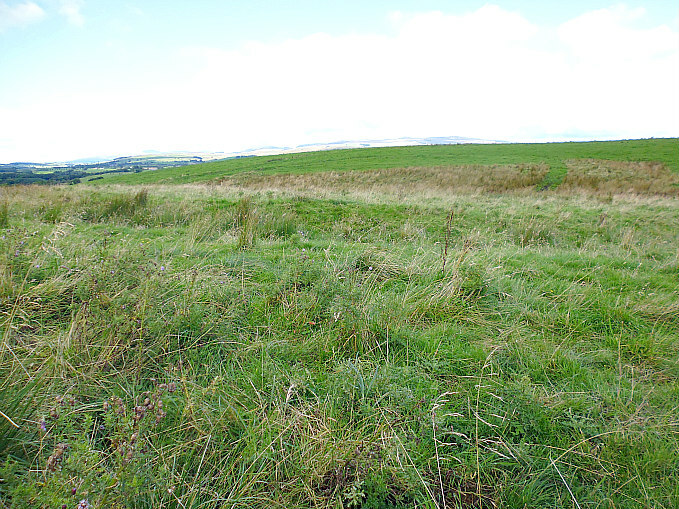 Cobers Laithe Earthwork, south-side (looking north-west). 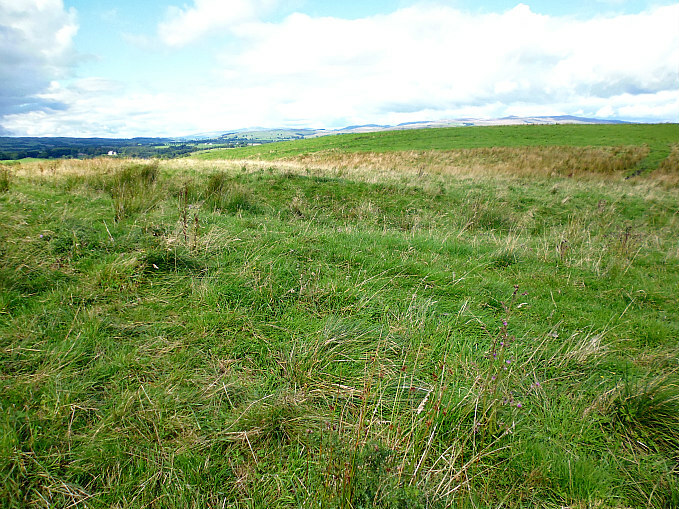 Cobers Laithe Earthwork, south-side (looking north-east). OS grid reference: SD 8669 5340. Sadly next-to-nothing is known about the oval-shaped earth-work or enclosure near to Cobers Laithe farm on Swinden Moor, which is also known as Swinden Earthwork and Swinden Roman Camp, just 1 mile east of Nappa, North Yorkshire. Was it a Roman camp, as a few have suggested, or was it perhaps a Brigantian settlement – at the time of the Roman invasion? Or was it a more typical Iron Age settlement or enclosure? We don’t know with any certainty. And also it is a bit of an odd sort of earthwork-enclosure as it is intersected through the middle by a stream, and there are a numble of circular pits (bell pits), especially at the N side. The earthwork lies on private land. It is located in a field close to Mill Lane at Swinden – between Bank Newton and Nappa, just 380m to the west of Swinden Moor Head farm. On the earthwork side of the lane Ash Tree Farm is about 530m up the fields to the east. It is quite a large earthwork measuring roughly 107m x 87m and it used to have a smaller inner earthwork with a circular bank but this seems to have disappeared altogether, maybe due to farming and the stream. At the time of my visit the outer bank and ditch of the earthwork were deep in grass and reeds in several places, but despite that they are quite pronounced at the SE and SW sides. And at the N, NW and NE sides the bank and its associated ditch are still quite well-defined, and there is a possible entrance at the NW. But as to whether they were ramparts designed for warfare or security, we don’t know, but in my opinion I would think they were non-defensive. (The enclosure at the southern-side). The oval-shaped layout of the earthwork or camp does ‘not’ look particularly Roman to me. We know the Romans always built square-shaped fortifications. Although it could have been a ‘temporary’ Romano-British camp. However, there does not appear to have been much, if any, Roman activity in the area; and the theory that there was a temporary Roman fort or camp at Long Preston, in the field near St Mary’s church, seems to have all but died a death. 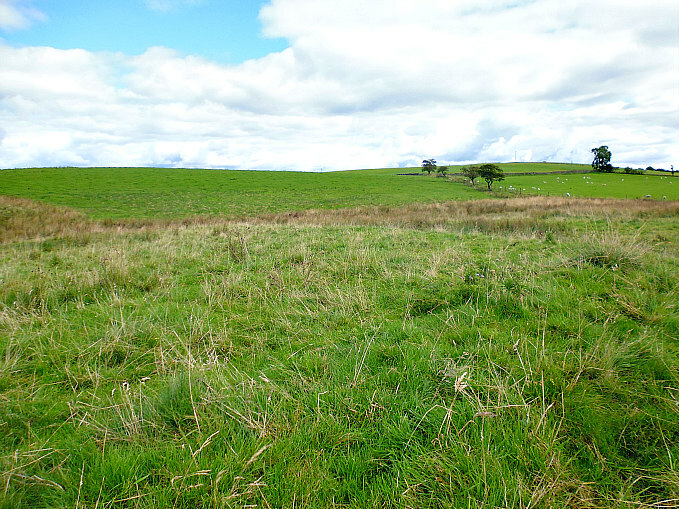 In all probability the earthwork here at Swinden was a Brigantian camp, settlement, or enclosure. But another distinct possibility being that this was a more typical Romano-British farmstead. Cobers Laithe Earthwork (southern-side grassy earthworks. 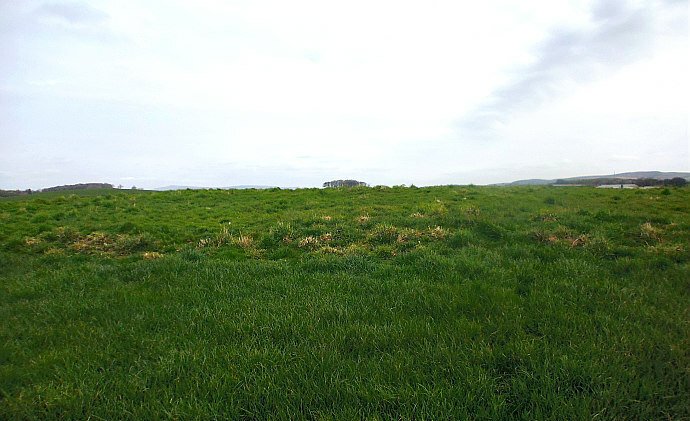 The relatively flat part of the earthwork, nearest the lane and fence, is on the south-side of the little stream while the northern and, by far the largest part of the earthwork, lies just beyond the stream and up the slight slope of the field beyond. But unfortunately the stream in between the two sections has made for some very muddy and boggy conditions, and so it is not easy to reach that ‘northern’ section unless you have wellies! Its quite obvious that the steam is a ‘more recent’ feature, having gouged out the channel through the centre of the ancient earthwork. To put it another way: the stream was not here when the earthwork was constructed. It was formed from a spring further up the field over hundreds of years, but certainly ‘not’ thousands of years. The northern part of the earthwork is pock-marked by holes or depressions (bell pits) in the ground, which are probably the result of quarrying for coal a few hundred years or so back. This poor or cheap coal substitute being used by local farms. Some of the holes have now become ponds. 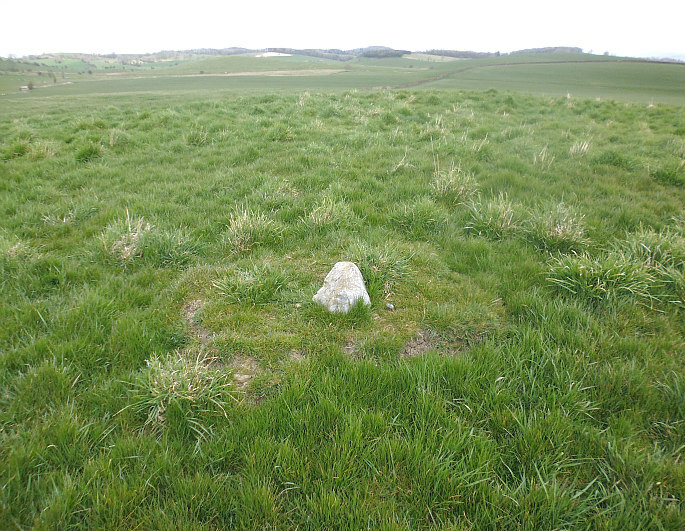 The Pastscape website has the site of an alleged Roman camp (monument no. 45530) about a ¼ of a mile to the north-west at Swinden (OS grid ref: SD 8617 5440), though this is perhaps an error? See the website link below. Categories: Earthworks, Roman Camp, Roman Sites | Tags: Cobers Laithe Earthwork at Swinden near Nappa in North Yorkshire | Permalink. SJ9709 9315. Werneth Low is a hill 279 metres high located just west of Uplands farm near Hyde in Tameside, Greater Manchester. It was the site of an Iron-Age settlement or enclosure on the south-west facing side of the hill, dating from the 1st century BC. A flint knife and a stone mace were excavated here. The Brigantes tribe who held the territory just before the Roman army arrived would have come here to the hill to celebrate both the winter and summer soltices. And what a wonderful sight that must have been! SJ9647 9352. Some 2 miles to the north-east of Werneth Low is another ancient settlement or farmstead called ‘Hangingbank’ just south of the A660. It is a low hill covering 3 acres that was inhabited from the middle to late Bronze-Age through to the Iron-Age. A number of Bronze-Age artefacts were found at the site. 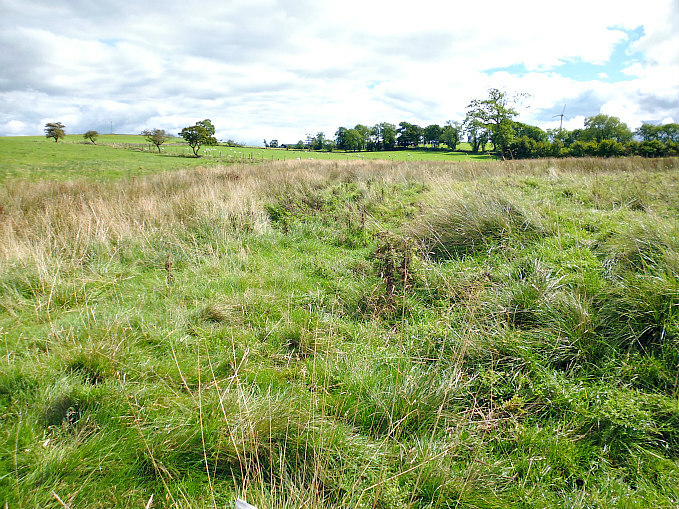 The earthworks at Hangingbank consist of a double-ditched enclosure with numerous crop-marks indicating where ancient field boundaries were. There may have been a Roman camp here in the 1st-2nd century AD as a shard of pottery was dug up from one of the ditches and a post hole was excavated. The course of the Roman road from Melandra Castle to Astbury supposedly crossed the site. Today a modern-day war memorial stands in the centre of the earthworks of the prehistoric settlement. Categories: Roman Camp, Settlements / Camps / Enclosures, Settlements / Enclosures, Werneth Low and Hangingbank | Tags: Werneth Low And Hangingback in Greater Manchester | Permalink.